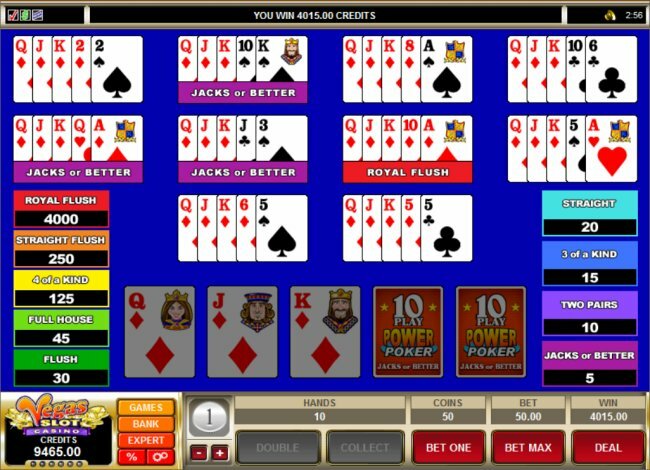 Video poker odds are very similar to those of regular draw poker in that the probability of receiving a particular hand is the same. Video poker is also like straight poker in that there are many variants found. So what are the main factors that determine whether or not you will walk away a winner? First, like in blackjack, you must play perfect strategy. 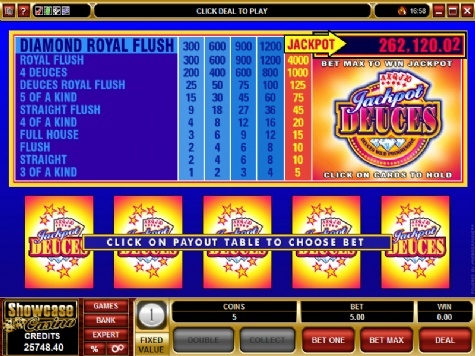 The strategy you would employ for a jacks or better video poker machine is different from the strategy you would use for a deuces wild game, and so on. If you are already an avid player, and are interested in becoming better, try picking up a book that specifically deals with all the various video poker games found in casinos today. Hold your initial cards and win up to ten times each round playing 10 Play Jacks or Better Power Poker. The second main factor that figures into your expectation for winning in video poker is the game's payout schedule. This is the table you see on machines displaying how many credits they return based on credits bet and winning hand combination. Another important factor is the house edge in video poker. The return to player is one of the highest of all casino games. With the house edge very small to begin with, you can easily try to play for demo mode and see for yourself that the payouts are good opportunities. If you didn't already know, just like slot machines, some video poker games offer a much better return rate than others. However, unlike their one-armed counterparts, it is easy to spot which machines are high-paying thanks to the conveniently placed pay table displayed on each game.The chart below shows you what to look for. While browsing the video poker choices at a casino, either land based or online, be sure to keep an eye on the pay schedules. Here's what to look for: on the chart to the right, the numbers in the first column represent the payout rates for Full Houses and Flushes at one unit bet. If you see a Jacks or Better game that shows a Full House pays 9 units, and a Flush pays 6, then you know the return rate for that particular game is approximately 99.5%, making it a solid bet. Ideally, finding a machine that is 10/7 or 9/7 is the best bet, because these machines have a payout percentage over 100. Does that mean they actually pay out more than they take in? It's pretty unlikely. Casinos aren't in the business of giving out more money than they take in. Even with a mix of high and low-paying games, casino operators know the machines that return over 100% will still make money because not everyone who plays them is an expert. Just like in blackjack, only a small fraction of all players is skilled enough to play with a positive expectation of winning. Once you have mastered the basic strategy for a type of video poker, and find a high-paying machine, then you can expect to make money in the long run. What does this mean? It means that after about 50,000 hands, the odds dictate that you will have hit every possible hand combination, including the coveted royal flush. Surely, that sounds like a lot of hands, but this game can go very quickly, especially for experienced players. It is not uncommon for a skilled video poker player to turn in 750 hands an hour - and even more if that person is playing two machines at once. If the player keeps this blazing pace up for eight hours a day, it will take just over eight days for the player to reach an expected win of around 1,750 credits. You can see why some people are very serious about this game - because you really can win at it. The only drawbacks are the time commitment required, and the potential swings in bankroll. Also, just because the odds say you should get a royal flush every 40,390 hands doesn't mean it's guaranteed. You could go five times that many hands and never hit one, or get five in the first hundred hands. Both scenarios are improbable, yet quite possible. Such is the allure of chance. Such is the allure of video poker. The chart above represents the pay schedule of a 9/6 Jacks or Better game playing the maximum five unit bet. The reason you should always play the maximum five units because this bet is required to win the 4,000 credit (or max) jackpot. If you got a royal flush playing only one or two credits, the payout would not be proportionally equal, so there is a strong incentive to always play take the five unit bet. If five credits per hand is too steep for your bankroll, there should be plenty of .25 credit machines for you to play. Online casinos always offer bets in multiple denominations, generally having a range that includes .25, .50, 1, 2, 5, and sometimes even higher credit betting units. From studying the Jacks or Better payout odds table, you may notice an inequality between the true odds and payouts of certain hands. Despite the fact that a full house is more likely to happen (1 in 86) than a flush or a straight, it has a larger payout. This goes against the grain in that the rest of the schedule is set up to reward hands that are less likely with higher payouts. Why is this? Again, game makers have slightly adjusted the payouts, but in this case it actually favors the player. In terms of payout percentages, there is a variety among video poker machines just like there is with slots. Remember, the lower-paying 8/5 video pokers are likely to be more common. Many land based casinos don't even feature the 9/6 variety. And, you definitely won't see any at convenience gambling locations such as bars, strip clubs, or airports. So be choosy. It's what will give you the positive expectation to win and what will make playing more fun. Play video poker at one of the internet's leading casino sites. Try several games including deuces wild and joker poker just for fun. credits), and also for getting diamond royal flush, which takes the jackpot. View a ranking of the top online casinos by payouts for video poker games. Browse winning pictures of standard and multi-hand video poker games. Try your hand at many different games of free play video poker, including tens or better, deuces & joker, and multi-hand power poker. Check a running jackpot total and get information about one of the biggest online games of progressive video poker. Browse winning pictures of standard and multi-hand video poker games, including first-hand accounts, in the video poker wins gallery. See which online casinos are paying out the best return rates to video poker players in video poker payouts.